Prior to 1993, Arnold Schwarzenegger's career simply sailed along a smooth course of undistinguished violent action pics. His filmography came punctuated by the occasional class project such as Terminator 2 or absurd "fish out of water" comedies like Kindergarten Cop or Twins. While some of these movies didn�t set the world on fire, they didn�t bomb either, so Schwarzenegger seemed to be a veritable box office "sure thing." All that changed in 1993 with the disastrous release of Last Action Hero. 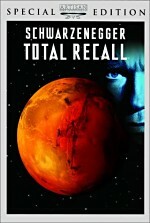 Both critically and financially, it was a flop of Ishtar or Heaven�s Gate proportions; so great was its failure that it seemed to threaten Schwarzenegger�s career. 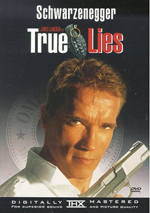 Thankfully for him, he rebounded the following year with the reasonably successful True Lies. Perhaps as a continued reaction to the failure of the semi-parody found in Last Action Hero, 1996�s Eraser placed Schwarzenegger back in the same mode he mined so well in earlier years. Unfortunately, while Eraser offers occasional thrills, it mostly seems unexceptional. Federal Agent John Kruger (Schwarzenegger) specializes in "erasing" members of the Witness Protection Program; if their covers get blown, he comes in and starts all over again. The film sets up his job through a sequence in which Kruger stages a number of deceptions to save a protected witness and his wife (Robert Pastorelli and Melora Walters). After this, Kruger simultaneously attempts to protect Lee Cullen (Vanessa Williams), his latest endangered witness, and also to get to the bottom of some deception within and outside his bureau. We follow these elements along with the inevitable violent action typical of Schwarzenegger�s films. While the production of Eraser certainly seems competent and professional, the film lacks any kind of spark that would set it apart from others in its genre. 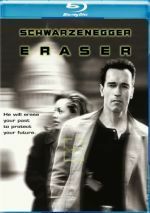 As alluded, Eraser bears a strong resemblance to Schwarzenegger's interchangeable testosterone-fests from the 1980s. Yeah, it boasts a higher budget and better production values than his earlier efforts, but other than that, it easily fits in with those movies. Ironically, although Eraser portrays no romantic involvement between Schwarzenegger and Williams, I can't decide if this is a step forward or backward. Yes, it's nice to see a movie that doesn't attempt to force artificial love interests down our throats. However, I can't help but be suspicious that in a film as clich� and rote as Eraser, the romantic engagement that we would expect between these characters fails to occur mainly because of fear in Hollywood about interracial love affairs. Admittedly, that's just speculation on my part, but I wouldn't be surprised to discover that's the case. I found the utterly banal nature of Eraser to be a surprise when I saw it theatrically. Director Charles Russell also helmed moderately spiffy fare such as The Mask and Nightmare on Elm Street 3 and I'd hoped he would bring similar flair to this project. Alas, it was not to be; he does a decent job with the fight scenes, but he makes no particular mark. The same seems true for the actors. Outside of Schwarzenegger, the film comes with a seriously "B"-level cast. I don't intend that as an insult to the actors involved; no, I simply mean to convey that for such a big budget, high profile effort, Eraser boasts a surprisingly cut rate cast. Schwarzenegger plays the same role he's done a thousand other times. Kruger's a typical white hat/no flaws good guy; there's not a whole lot of depth to the role. That's probably good, because Schwarzenegger never developed any ability to display nuance in his characters. It's not a mistake that his best work has come in the two Terminator films, roles that required him to play an emotionless automaton. Frankly, when Arnie attempts regular human emotions such as warmth or empathy, as he does occasionally during Eraser, the results continue to be embarrassing. He succeeds simply because he cuts such an imposing and effective presence. Like Schwarzenegger, Williams offers little other than her appearance. Williams is quite beautiful, but she possesses almost as few acting talents as does her co-star. Granted, her role asks her to do little other than play the helpless victim and be rescued ad nauseum by Schwarzenegger, but nonetheless she remains a stiff and weightless presence. James Caan provides a suitably crude and oily performance as our main villain, but he's simply not up to the level of other, more provocative baddies. Caan gets the job done, but like the film itself, he lacks any kind of distinguishing flair that would take his character to a higher level. All in all, Eraser makes for a competent but highly pedestrian film. Eraser appears in an aspect ratio of approximately 2.35:1 on this Blu-ray Disc. The transfer didn�t leap off the screen, but it seemed compentent. Sharpness tended to be less consistent than I�d expect. While some scenes offered nice detail and clarity, others came across as a bit soft and indistinct. This left us with an overall impression of generally good delineation but not much that seemed especially precise. Jagged edges and shimmering failed to appear, but I saw light edge haloes at times. Print flaws weren�t an issue, however, and with reasonable grain on display, I didn�t suspect any excessive digital noise reduction. Colors tended to be somewhat flat. The movie tended toward a bluish palette and the tones failed to deliver much life; they seemed acceptable but not better than that. Blacks were fairly deep, and shadows showed fair clarity; they could�ve been more natural but they gave us watchable elements. Nothing here looked bad, but I thought the image lacked the definition and flair I�d expected. At least the movie�s Dolby TrueHD 5.1 soundtrack fared better, as the action material used the spectrum in an involving manner. The mix created a good sense of place throughout the movie and came to life well during the more action-oriented scenes. Those spread to the side and rear channels in a worthwhile way that formed involving scenarios. Audio quality seemed fine. Speech was fairly concise and natural, while effects showed appropriate range and impact, with positive low-end when necessary. Music appeared full and rich. The mix suited the material and added life to the film. How did the Blu-ray compare to the original 1997 DVD? Audio appeared broader and fuller, while visuals were tighter, cleaner and more dynamic. Eraser was an early DVD that hasn�t held up well, so even with its flaws, the Blu-ray offered a major improvement. Don�t look for extras here, as you won�t find any. The Blu-ray doesn�t even bring back the trailer from the DVD. Eraser stands as a perfectly mediocre mid-1990s action film. While it boasts occasional thrills, it seems too generic to be more than average. The Blu-ray provides solid audio along with erratic visuals and no bonus materials. This isn�t an impressive presentation, but it still works better than any other home video version of the film.